What can entheogens teach us? In 2010 I was fortunate to be a presenter on the subject of entheogens at a fascinating conference in San Rafael, California, titled “Beyond the I… the end of the Seeker’. The conference organizers had recruited a remarkable collection of physicists, neuroscientists, consciousness researchers, and spiritual teachers, all with a common interest in what turned out to be the rather hazy subject of ‘Science and Non-Duality’. (I say that I was fortunate to present because I was also able to attend workshops and lectures with some of my personal heroes including the physicist/authors Peter Russell, Amit Gotswami, NASA’s zero-point scientist Bernard Haisch, anesthesiologist Stuart Hammerhof on his and Roger Penrose’s theory of Quantum Consciousness, and a remarkable presentation by Nassim Haramein exclusively on his paper about the Schwarzschild Proton). The entheogen section of the conference — titled ‘Entheogens as a Portal’— was a panel comprising of Rick Doblin (MAPS), Dr. Martin Ball, James Fadimann, myself and a couple of other speakers (whose names I must confess I don’t remember) all who received 20 minutes to speak about entheogens and (I presumed) ‘non-duality’. The Oroc Mystical Value Scale. 8. MDA: (Sassafras). Empathogen. The original 1960’s ‘Love Drug’. As with all the compounds in this class, empathogens can decrease the effect of Ego by inducing love and compassion to others, weakening the sense of ‘I’. Empathogens also differ from psychedelic/entheogens in their acute toxicity, with deaths caused by cardiac arrest/brain hemorrhaging at a fatality rate of approx 2 in 100,000 users, approximately the same as the more popular (though less toxic) MDMA. 9. MDMA (Ecstasy). See MDA. Rediscovered and popularized by chemist Alexander Shulgin in the 1980’s, MDMA held great promise for psychiatry before becoming illegal in a wave of Federal paranoia. Currently being used in hospital trials in Israel, the organization MAPS (Multi-disciplinary Association of Psychedelic Sciences) wants to start clinical trials on returning soldiers with post-traumatic stress syndrome here in the USA. 10. THC (Cannabis or ‘marijuana’). Decreases the effect of the Ego by shifting perspective, often towards the humorous side. Relatively low toxicity, no possibility of physical overdose. While cannabis related crimes are the number one reason for incarceration in the USA, with over a million people in jail for its sale, distribution, production, or possession, there has never been a single death related to THC consumption itself. 11. Opiates/Heroin: Nullifies the Ego by negating all desire although not the sense of “I”. Highly physically addictive with regular fatal overdoses, heroin was involved in 213,118 Emergency Room (ED) visits in 2009. Meanwhile Oxycodon fatalities (OxyContin is a semi-synthetic opiod pain reliever derived from opium) have increased 66.7% over the last five years due to this pain-medicines relatively high toxicity. (14,459 in 2007 … 82,724 people died from FDA approved drugs in 2010.) ED visits involving nonmedical use of pharmaceuticals (either alone or in combination with another drug) increased 98.4 percent between 2004 and 2009, from 627,291 visits to 1,244,679. OxyContin sales currently exceed $4 billion per year. 12. Cocaine: The ultimate ‘Me’ drug. Physically and psychologically addictive. Highly toxic. A nervous-system stimulant, cocaine dependence (addiction) can result in cardiovascular and brain damage. The Greed Culture of the 1980’s that came only 15 years after the ‘Psychedelic Revolution’ can almost be epitomized by its reverence to cocaine, the most expensive drug that does the least for the shortest amount of time. In 2009 Cocaine and crack cocaine overdoses were responsible for over 400 000 ED room visits in US hospitals. While the first ‘cocaine epidemic’ in the USA was in the 1880’s, cocaine has greatly grown in popularity since the 1970’s, with the estimated U.S. cocaine market exceeding $70 billion in street value in 2005 – a greater revenue than a corporation such as Starbucks. The multi-billion dollar ‘War against Cocaine’ has been waged at the military level in foreign countries since the 1980’s with no noticeable affect on supply, while drug violence long the border of Mexico – mostly over the cocaine and methamphetamine trade – is killing more than 5000 people a year. 13. Methamphetamines. Physically and psychologically addictive. Highly toxic. The highly lucrative illegal underground market of the USA’s most-popular legal drug (Ritalin and Adderall are legal methamphetamines – the USA consumes 85% of the world’s prescription speed.) Sometimes called ‘white-trash cocaine’, methamphetamine abuse is reaching epidemic proportions at many levels of American society with over 93,000 ED room visits in 2009. Crack cocaine and methamphetamine addiction have long been associated with both forced and voluntary prostitution in every country that they appear in, while the violence associated with Mexican drug cartels fighting for control of a cocaine and methamphetamine market valued in excess of 50 billion dollars is currently responsible for over 15,000 fatalities a year. 14. Alcohol: Considered a psychoactive depressant. Highly toxic and physically addictive. The United States Center for Disease Control estimates that medium to high consumption of alcohol leads to the death of approx 75,000 people a year in the USA. While the last three compounds on this chart – Cocaine, Methamphetamine, and Alcohol – are the only three compounds most likely to reinforce the Ego to the point of physical violence, alcohol is the one your most likely to do yourself physical harm on due to self-loathing. Alcohol is the most common extenuating factor for homicides, rapes, beatings, and suicides, not to mention vehicular fatalities. Alcohol is arguably the least sophisticated drug in both its production and its crude inebriating effects. The first alcoholic beverages can be traced back 9000 years to Neolithic times, which is why I like to call it our ‘stone-age drug’. Paradoxically, (or perhaps because of its ancient origins) alcohol it is the only 100% legal drug on this list in the vast majority of countries around the world. Oroc’s Law: The more a compound disrupts the Ego (the sense of ‘I’), the physically safer (less toxic) that compound will be, while the more a ‘drug’ reinforces and inflates the sense of Ego, the more physically harmful (toxic) that compound will be. Based on this highly scientific report, my observation about the related toxicity of my Mystical Value scale would seem to have been validated, with those ‘drugs’ that most eradicate the effect of the Ego being deemed (by public health experts) the safest. Non-addictive and of low toxicity, psychedelic ‘drugs’ offer no threat to your physical health, and yet they are considered by our Society to be extremely ‘dangerous’ and are amongst the most illegal substances on the planet. The word drug incidentally—which means (in this context, according to the Webster’s dictionary) ‘a chemical substance which enhances physical or mental well-being’— is a ridiculously misleading and almost meaningless word if you think about it, since nearly everything we eat and drink can be considered a drug. Nitrous oxide, a gas, is a drug. Coffee, tea, sugar, and chocolate are all drugs. Even McDonalds french-fries under this broad definition could be considered a (highly addictive) drug. Now, as much as I love chocolate, coffee, and even — I hate to admit it — the occasional McDonalds French-fry, I see little purpose in comparing them in any way, shape, or form, to LSD, DMT, or 5-MeO-DMT, which are far more likely to completely change your consensual reality then they are ‘enhance your physical or mental well-being’. But the very use of a word/term as broad as ‘drugs’ (drug law, drug war, illegal drugs, dangerous drugs etc’) to describe and legally regulate (DEA) such a ridiculously broad range of compounds is in it’s self a verbal smokescreen designed to help limit the distinctly society-changing possibilities of psychedelic-entheogens. Disregarding the potential (and well-documented role) that the CIA played in the introduction and distribution of virtually all the illegal drugs that became available, by failing to recognize the essential difference of psychedelics/entheogens—that they are best used carefully in a sacred manner with trusted guides and not wildly in recreation amongst crowds of strangers—and then by lumping the wide-variety of compounds that followed into a singular ‘Drug Culture’ that fails to distinguish between the wide variety of experiences that this vast family of so-called ‘drugs’ can produce, the Alternative culture that had been inspired by psychedelics and the chance for change, ended up settling for uppers-and-downers and the Status Quo, as heroin, cocaine, and amphetamines became the most popular ‘illegal drugs’ of the last thirty years of the 20th century. (And the use and abuse of legal ‘prescription drugs’ sky rocketed). A radical reassessment of the effect of capitalism and consumerism on both the human condition and our planet is clearly required, but what can bring about a change in a viewpoint that has been steadily being programmed into us by the very technology whose reckless use we need to reassess? According to the Dalai Lama ‘achieving genuine happiness may require bringing about a transformation in your outlook, in your way of thinking, and this is not a simple matter’ and I believe this applies to us as much as a Society as it does to each of us individually. But what can any of us really do other than reorganize deck chairs on the Titanic? What action can actually have a chance of bringing about a fundamental transformation in the way Humanity perceives and values Life on this planet? In July of 2003 when first introduced to the super-entheogen 5-MeO-DMT, I underwent what I now believe to be a ‘classical’ mystical experience of transpersonal unity with the Source of Being. This event had a profound effect upon my world-view since I found myself changed from an agnostic scientific-rationalist to believing in the existence of a God far greater than I could have ever imagined, all in the space of a single 40 minute drug-induced ‘trip’. The result for my subsequent search for answers on how such a radical transformation could have occurred is contained in my book “Tryptamine Palace: 5-MeO-DMT and the Sonoran Desert Toad.” (Park Street Press, 2009), and within the pages of that book I make the claim that this discovery of a spiritual element to the Universe, and the realization that God not only CAN exist but exists —as the mystics have always insisted—as a part of you, is the most exciting realization that a human being can make. More than eight years have now past since I myself made that unexpected discovery, and while I still agree that is ultimately the most exciting discovery possible, I must concede it is not always the most practical, a dilemma that mystics have known and have suffered for since the beginning of time. The personal discovery of God—any kind of God or Buddha-State, for they are all streams of the same Cosmic river—can never be ‘scientifically’ proven and inevitably any entheogenic realizations or enlightenment can only offer the same proofs as any other ‘spiritual’ system … the sticky dual-problem of personal testimony and ‘faith’. Which brings about the about the very interesting possibility—as suggested by the psychologist Julian Jaynes in his increasingly influential book ‘The Origin of Consciousness in the Breakdown of the Bicameral Mind’—that the modern highly-individualized human Ego that has been so venerated in the 19th and 20th centuries may be a comparatively recent development in both human history (and perhaps the history of the Universe), and that ‘the voice in our head’ that we now all constantly hear, a few thousand years ago would only arise only in times of severe crisis and danger. (And was often thought to be the voice of the Gods). The non-denominational spiritual teacher Eckhart Tolle in his modern classic ‘A New Earth’ argues that our highly refined sense of ‘I’ has come from the development of our technology-driven Society, since the narrowing of our mental focus away from the transpersonal has allowed us to develop our fantastic technology, but at the expense of disconnecting us with another deeper layer of consciousness that we share with all other things in the Universe. We can no longer see the woods for the trees so to speak, as we have become prisoners of our own inflated sense of self. 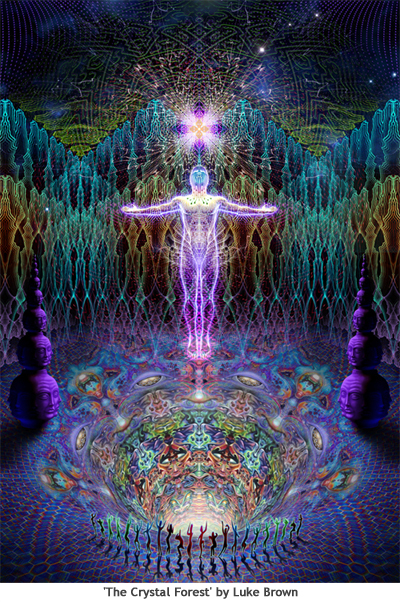 As our scientists start to discover the outer realms of Quantum Consciousness, and our psychologists and spiritual masters begin to return our attention to the idea of a Cosmic or Absolute Consciousness that both unites and transcends all religion, with the role that the Individual Ego plays in our Society coming under increasingly critical scrutiny, then it would seem clear the lesson that the careful use of entheogens can teach virtually any of us. It is a scientifically verifiable fact that entheogenic compounds can cause a human ego to be disrupted or even momentarily wiped away, and that when this happens, to paraphrase the poetic words of William Blake, the doors of perception are cleansed, and all things appear to man as they are, Infinite. Throughout the recorded history of Humanity there has been no experience considered more profound or more valuable then the singular realization that All is indeed One, and now as the scientists have begun to catch up with the mystics on realizing the simple undeniable fact that all systems are linked, and that the very idea of the ‘sacredness of the individual’ is somewhat absurd, we now need to reform our governments, our religions, our financial institutions, our schools, and most importantly ourselves, to this fundamental Universal Truth. In a world where we have been programmed by the constant sounds and flashy moving images of our rapidly developing modern technology since we have been born, the ancient schools of meditation and contemplation have had little chance to reform the Ego or the society that our love of technology—the human child of the Ego—has built for us, since we have long since forgotten that the death of the Ego is a desirable goal. Deepak Chopra once wrote that synchronicity is the universe showing its intention, and therefore I do not find it strange that mescaline was first synthesized the year that Röntgen discovered radiation, or that Albert Hofmann had a strange dream to reinvestigate a compound that he had put on a shelf many years earlier, thereby instigating a chain of events that would cause him to discover LSD-25’s remarkable psychoactive qualities while the Manhattan Project was months away from igniting the world’s first atomic bomb, arguably humanity’s most egocentric invention. Lysergic Acid (LSD) is a remarkable 20th century invention in the fact that it is the only entheogen that a competent chemist can make a million hits of in an afternoon, and its mass-production qualities (for a mass-production society) should not be under-valued, since it has been responsible for reintroducing the mystical/shamanic concept of the death-and-rebirth of the Ego into our Society at a time when it is most desperately needed. An entheogenic moment outside of space of time can cause a lifetime of egocentric programming to come tumbling down like a house of cards, an illumination almost impossible to ignore, and it is for exactly this reason that our Governments so fear them. If we build the foundations of the Entheogenic Revolution —the 2nd Psychedelic Revolution— upon the basis of a constant awareness of the influence of the Ego, and seek out a deeper connection with the Mind of the Universe that we all share in a process of ‘liberation theology’, then we have a chance to rebuild our tribes into a true World Family that will find a way through the troubling times to come. For if there is one thing that is for sure, it is that none of us will make it alone. An entheogen (meaning ‘God-contained-within’) is a compound that induces a spiritual or mystical experience. We will be posting very soon! Please come back and visit.